LoTROInterface : Rich! : Rich! I threw this plugin together quickly so I could track the quest cool-downs for the treasure hunt event (named after the /rich emote from the same event). It reads from your chat log to determine when you complete the quests and will begin counting down until the quest resets. This way you can enjoy treasure hunting, but know exactly when to return to the quest bestowers. If you're in the treasure hunt area it will also tell you how long the current round has been running for. To install, copy the 'GaluhadPlugins' folder to your plugins directory. The plugin currently supports English and German (translations provided by Venogorn). /showrich - shows or hides the main window. 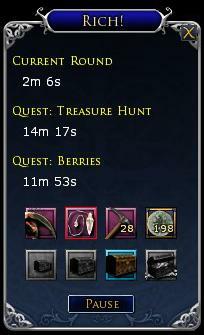 Changed the 'Burried Treasure Token' icon to a proper item info control which can be inspected/linked as normal. Added barter window with items. Added fields to the string files to allow for future russian translations. Made some adjustments to improve stat gathering. Should all work properly now. Introduced a stat window which will display some statistics for each character from the treasure hunt. This has been gathering data since the early release so you will find a bunch of stats already available. Added stat entries for total tokens looted and total tokens spent - These won't have any history so will only show present values until future events. German translations added with thanks to Venogorn. Updated the 'Treasure Tokens' code so it now looks in your barter wallet instead of your backpack. Very useful plugin! *kudos* I've just completed the somewhat half done translation into german. I have Upload a patch for french client. During the translate, i saw a bug with the plugindata. It's just for the french client or is a global error? Last edited by Galphoglas : 09-28-2017 at 01:58 PM. Turbine re-translated the picks for German client, so the rich plugin doesn't show the amount of picks in inventory. I love the plugin, very helpful. A possible suggestion would be to show quick travel map in the window in case you want to make sure you have bought one before leaving the treasure hunt area and/or use it without looking for it in your bags. Also the barter list is missing the newest cosmetic pets, but I do not use the barter list feature anyway. Last edited by Hyoss : 08-25-2014 at 12:41 PM. Suggestion: Instead of /showrich, add the command /getrich. I think it's the UTF encoding in the strings file. I've adjusted in and am about to reupload. Let me know if you have any more problems with the new version. Last edited by Galuhad : 06-20-2014 at 02:12 PM. There is an issue with the german client. But i think its on Turbine. The new and previous version of rich doesnt show items which contains german umlauts. no claws (Höhlenklaue), no tokens (Münze). After the quest countdown is zero, the Umlaut is masked in text: "verf?gbar" instead "verfügbar". The tokens only show three digits. I have now 1003 tokens but the plugin shows "100". This is fixed in the latest version and will display correctly. Last edited by Galuhad : 11-17-2013 at 05:34 PM. Just a minor clarification, this is Galuhad's plugin, not Garan's. 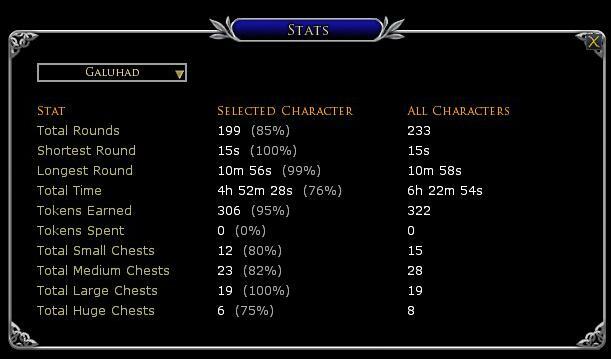 The change to show more digits in the quantity should be fairly minor but I don't know if Galuhad is still playing LotRO. Last edited by Garan : 11-10-2013 at 01:46 PM. the plugin works great even in 2013 on the German client. Hopefully HD will not break this for next year. The tokens only show three digits. I have now 1003 tokens but the plugin shows "100". If there is just not enough space, concider to show "1k" and ">1k" instead. Does this mean I have to log in again? Last edited by Galuhad : 06-28-2013 at 11:12 AM.